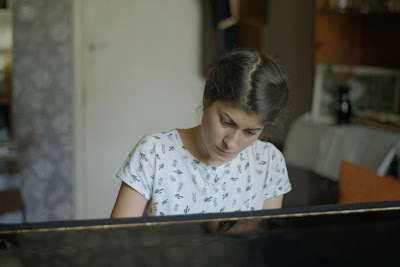 Minimalist drama follows teenage Milla who wants to go off and play piano, her younger brother Niki who simply wants to be silly and their dad who simply wants to talk about grand things and not deal with real life. Largely plotless the film is more a series of moments that add up to a a portrait of a family over a period of time. Its a very well made film that is going to play best if you life small whisper thin films where not much happens other than life. I was very mixed about the film. I love the technical aspects of the film, from the look, the acting and so on, however the fact it really is less concerned with things happening than it is in people reacting kind of lost me by the half way point. Yes I knew what it was doing but I didn't much care. Recommended for the art house crowd and those for whom the New Directors New Films less mainstream films are the manna for your soul.